First, he expressed the importance of developing one’s ability to think. He emphasized that those who think on a larger and deeper scale are able to understand a multitude of different relationships, such as the one between objects and nature. President Sung linked the future of a country to the quality of its ideas by stating, “it is with the power of thought that human society can develop. This is the most important factor in determining the fate of a country.” He also stressed that as much as it is the university’s role to inspire ideas, it is also upon the students to invest their time in developing their own thinking skills. Second, President Sung expressed his wishes for students to not merely be followers but to become leaders. He defined a leader as “someone who paves a new path rather than taking one already walked on by others.” In his speech he recognized that although daunting and obstacle-ridden, a new path must be discovered in order for the country to make progress. 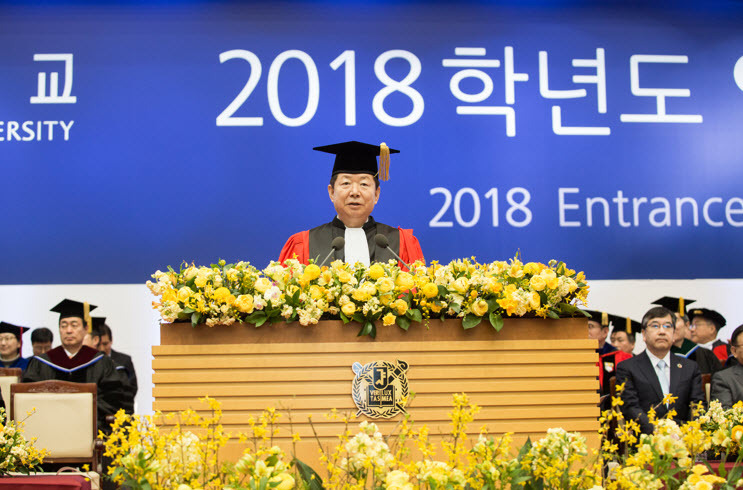 President Sung defined a leader as someone who is able to think comprehensively and be able to integrate expertise of both inside and outside the academic realm. He claimed that those who are able to do this will become innovative leaders, revolutionizing the ideas of today. The president also addressed parents, telling them that this day marked the students’ transition into independence. He advised parents to let their children experience this new period of life through trial and error and to give the students room to overcome obstacles on their own. He emphasized how this would be the imperative in the students’ success and adaptability later on when they move out into society. President Sung concluded his speech by once again offering his warmest congratulations to the incoming class and wished the new incoming class the best of luck as they embark on their academic journeys here at SNU.